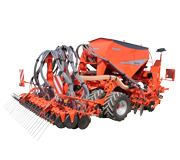 The SC Seeders find the perfect balance between high-tech performance and ease of operation. They work hard, yet are easy to transport. In designing the series, every detail has been considered, including ease of access when it comes to maintenance. The SC Series can help boost your efficiency, save you time and money. It puts precision farming at your fingertips.